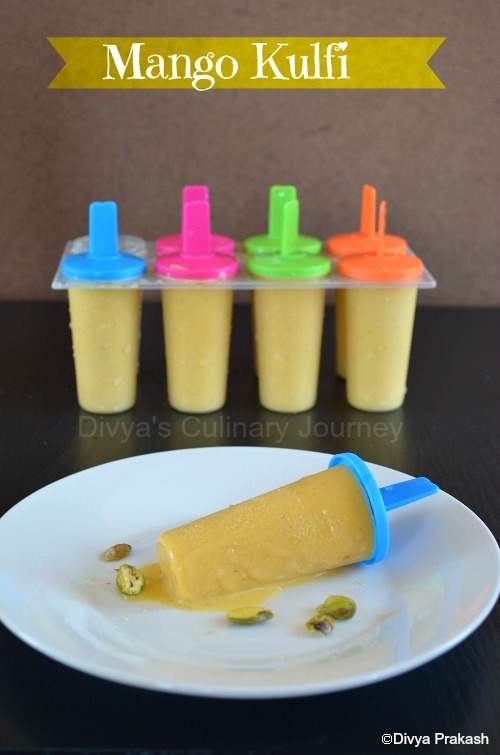 Today's recipe is Mango Kulfi. The weather is getting warm here and It feels nice to have something cold. Recently I came across this recipe from Nalini's site. I had all the ingredients and was easy to make. So decided to give it a try. Wow! It was so yummy & we all loved it. Powder the cardamom along with sugar and set it aside. In a heavy bottom pan, mix milk, condensed milk, milk powder without any lumps, heat it and bring it boil, and let it simmer for 15-20 minutes, add the powdered cardamom mix well & Turn off the heat and let it cool down. 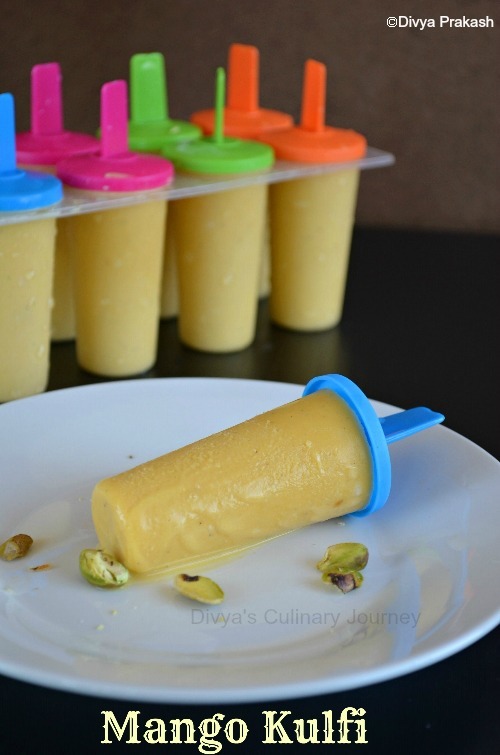 Once it is completely cooled, mix mango pulp to this and pour the mixture into the kulfi/popsicle mould and freeze it for 6-8 hours for it to set completely. Un mould the kulfi and serve. I have used sweetened condensed milk and sweetened canned mango pulp, so except for powdering the cardamom, I have not added any extra sugar. In case if you are using fresh mango pulp, then add sugar according to your taste. To un mould the kulfi, run it in tap water for 30 seconds and pull them gently. Very inviting cute kulfi...summer delight for sure. Yummy mango Kulfi... Lovely Divya. Delicious and tempting.. Nice clicks..
Yummy.. I made this too last year when I was in India..here we don't get nice mangoes here..
None will resist to this droolworthy kulfi, feel like relishing some rite now,eventhough its raining outside. Looks tempting and can't control myself. thanda thanda cool cool kulfi. even in winter i can have dis..so cool n colourful moulds.. 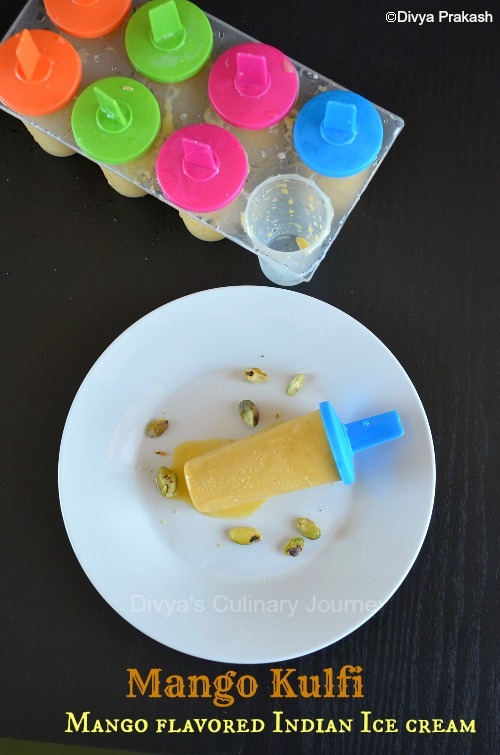 So I tried a few different recipes of kulfi last week and this one is THE best! So easy to make and so very yummy!!!! Thank you ever so much for sharing!